Women and men who have loose a abdominal skin and fat that is concentrated in the abdomen can benefit from tummy tuck. Sometimes these conditions are inherited. In other instances, substantial weight loss may cause abdominal skin to become flaccid.It also can tighten muscles that have been separated and weakened by pregnancy. The procedure may somewhat improve the appearance of stretch marks, especially those located below the navel. Surgery involves the removal of excess skin and fat from the middle and lower abdomen in order to tighten the muscle and fascia of the abdominal wall. It is also a frequent surgery for Triad Syndrome later in life. For full tummy tuck an incision is made from hip to hip just above the pubic area, another incision is made to free the navel from the surrounding skin, the skin is detached from the abdominal wall to reveal the muscles and fascia to be tightened. the muscle fascia wall is tightened with sutures, the remaining skin and fat are tightened by removing the excess and closing the defect, the old belly button stalk is brought out through a new hole and sutured into place. Liposuction is often used to refine the transition zones of the abdominal sculpture, a dressing and sometimes a compression garment are applied and any excess fluid from the site is drained. For a mini tummy tuck a smaller incision is made, the skin and fat of the lower abdomen are detached in a more limited fashion from the muscle fascia, the skin is stretched down and excess skin removed. Sometimes the belly button stalk is divided from the muscle below and the belly button slide down lower on the abdominal wall. Sometimes a portion of the abdominal muscle fascia wall is tightened, liposuction is often used to contour the transition zone, the flap is stitched back into place. Complete Abdominoplasty extends into the thighs and flanks. This is a component of a lower body lift and can be combined with liposuction contouring, breast reduction, breast lift, or occasionally hysterectomy, depending on the reason for the hysterectomy. 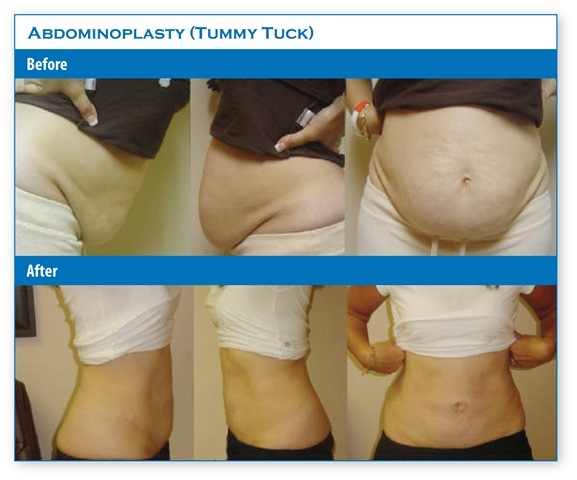 The cost of the tummy tuck varies from country to country and even within locales of countries. As with most cosmetic surgery operations, the cost depends on a variety of factors like the age of the patient, their weight and the state of their health. Depending on the individuals, there may also be other costs involved after the operation. This does not include the follow up visits as required by some doctors. On average in the United States, this procedure can cost from 4,000$ to as much as 20,000$. The pre operative and post operative care facility fees, anesthesia and medications must be taken into consideration when reviewing surgery costs. No surgeries are a guaranteed success and therefore a second procedure or a touch up may be required to achieve the desired appearance. These costs are typically not included in original cost.